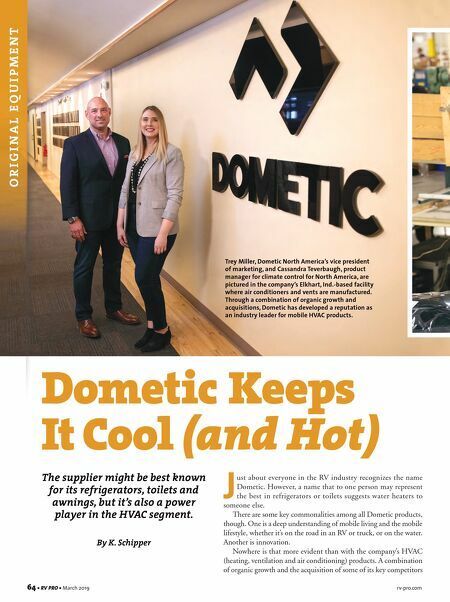 rv-pro.com March 2019 • RV PRO • 65 has given Dometic the reputation as an industry leader for mobile HVAC. And, while innovation might not be the first word that comes to mind thinking about HVAC, whether it's a Class B owner talking to a service center about replacing a vent system or an OEM looking for a new design for a fifth wheel, Dometic will be there to make sure everyone has the best solution possible. 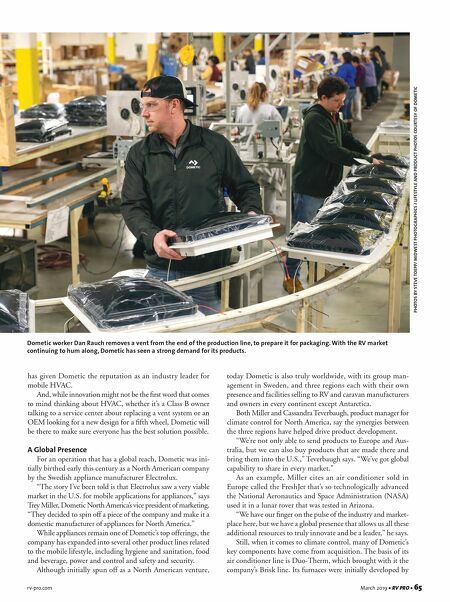 A Global Presence For an operation that has a global reach, Dometic was ini- tially birthed early this century as a North American company by the Swedish appliance manufacturer Electrolux. "The story I've been told is that Electrolux saw a very viable market in the U.S. for mobile applications for appliances," says Trey Miller, Dometic North America's vice president of marketing. "They decided to spin off a piece of the company and make it a domestic manufacturer of appliances for North America." While appliances remain one of Dometic's top offerings, the company has expanded into several other product lines related to the mobile lifestyle, including hygiene and sanitation, food and beverage, power and control and safety and security. Although initially spun off as a North American venture, today Dometic is also truly worldwide, with its group man- agement in Sweden, and three regions each with their own presence and facilities selling to RV and caravan manufacturers and owners in every continent except Antarctica. Both Miller and Cassandra Teverbaugh, product manager for climate control for North America, say the synergies between the three regions have helped drive product development. "We're not only able to send products to Europe and Aus- tralia, but we can also buy products that are made there and bring them into the U.S.," Teverbaugh says. "We've got global capability to share in every market." As an example, Miller cites an air conditioner sold in Europe called the FreshJet that's so technologically advanced the National Aeronautics and Space Administration (NASA) used it in a lunar rover that was tested in Arizona. "We have our finger on the pulse of the industry and market- place here, but we have a global presence that allows us all these additional resources to truly innovate and be a leader," he says. Still, when it comes to climate control, many of Dometic's key components have come from acquisition. The basis of its air conditioner line is Duo-Therm, which brought with it the company's Brisk line. Its furnaces were initially developed by PHOTOS BY STEVE TOEPP/ MIDWEST PHOTOGRAPHICS / LIFESTYLE AND PRODUCT PHOTOS COURTESY OF DOMETIC Dometic worker Dan Rauch removes a vent from the end of the production line, to prepare it for packaging. With the RV market continuing to hum along, Dometic has seen a strong demand for its products.